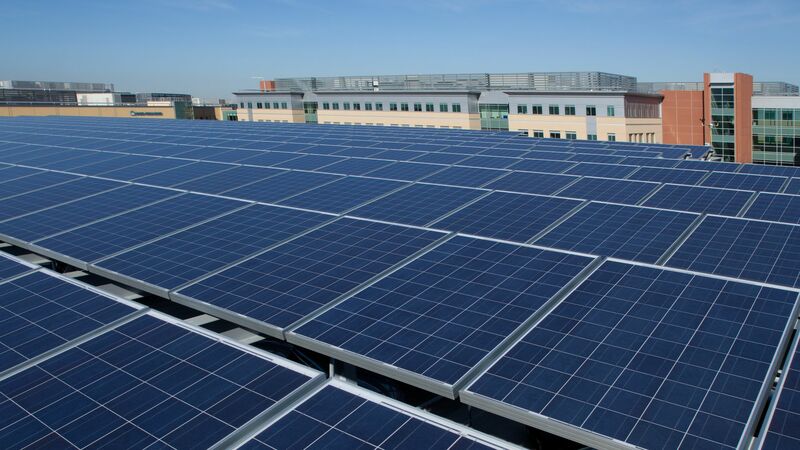 Kaiser Permanente, the multi-state network of hospitals, doctors and health insurance, is buying significant amounts of renewable energy and building solar and wind farms in an effort to be carbon-neutral by 2020, CEO Bernard Tyson said in an interview. The big picture: The health care industry will have to be part of climate change solutions, given that it accounts for about 10% of U.S. greenhouse gas emissions. Reality check: While Kaiser is a large system with more than 75 million square feet of hospitals and other real estate, that's a relatively small footprint. The land area of the city of Oakland, where Kaiser is headquartered, is about 1.6 billion square feet by comparison. However, shifting to renewable energy at hospitals would be particularly beneficial because they are intensive energy hogs. Why now: "The massive fires that we're dealing with in California — I don't need to debate whether that's a climate issue," Tyson said, adding that climate change has direct and indirect effects on people's health.